You mean you have to wash your washing machine?! Apparently with HE washing machines, you do. Or at least that’s what Tide wants you to think as you put another $18 worth of Tide Washing Machine cleaner into your cart. But does it work? Read on for my Tide Washing Machine Cleaner review. We have a top-loading Maytag Bravos HE washing machine (bought new in ‘09). We do about 5 loads a week in it, all in the same day, and then we don’t use it again for 6 days. Over the last year it developed a stink that got progressively worse – like, to the point where I could smell it outside the laundry closet. Gross. I poked around the machine’s nooks and crannies hoping to at least get a handful of mold to explain the problem, but no source was found. When I realized I was washing my pillowcases in a giant metal armpit, it was time for the funk to go. When I saw Tide Washing Machine Cleaner I figured I’d give it a try and report back. Tide Washing Machine Cleaner is like a nuclear scrub for your tub. Open the packet, dump it into your tub, and run a cycle using hot water. Your machine proceeds to bathe itself. These are pricey at $8.39 for a box of 3 packets, which works out to about $3 after taxes for a single cleaning. 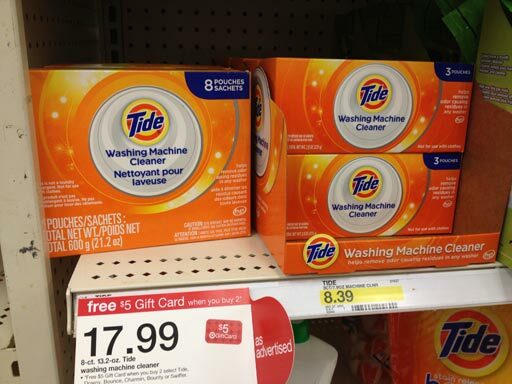 At this price, it’s no wonder Tide tells you to use it monthly (uh thanks, but no). I’ll wait until it starts to stink again before using another packet. It seems that our situation was one that was treatable by the Tide product, so hooray! So What Causes an HE Washing Machine to stink, anyway? In researching our stinky washer problem, I learned that washing machine stink is often from the leftover detergent being allowed to get mildewy. (There are other sources, so if a Tide bombing doesn’t work for you, consider further investigation). But since we live in the PNW where anything that sits idle for more than a few hours starts to accumulate mildew, it seemed likely that we were dealing with a run of the mill mildew accumulation. We don’t keep bleach around but I imagine I could run a lot of bleach loads before I approached the cost of these Tide packets, so once I use up all my packets I’ll try the bleach technique and report back. I also read that these packets seriously gum up front loaders, so please keep that in mind as you decide if Tide Washing Machine Cleaner is right for your smelly machine! Yes, wow, I haven’t used that name in a while! Where do I know you from?